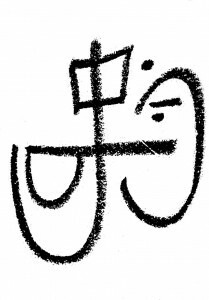 Sometimes, a sigil is most powerful when it is a reminder of something you already have etched into your soul. The “magick” is in that certain knowing that inside you is a force more powerful than the drudgery and tedium of your problems. It is a seed, pressing its way through that heavy soil with swelling hope, gasping towards the sun. We are creatures of that same soil: rocky, muddy, trodden upon and fundamentally composed of things we’d rather not dwell on. To overcome them is a constant process of plodding, slow growth in the direction we desperately hope is upwards. This sigil, suggested by one of our Twitter followers, explores this idea. It does not ask for a quick fix, or an uncanny change to the elements inside. It is simply about rising — overcoming — the very limits we found ourselves planted in. As with all sigils, the more specific the content the better the results. In this case, the invoker is well aware of her specific situation, and can address these during the activation ritual. For you, it might be better to spell out exactly the difficulties you wish to overcome.